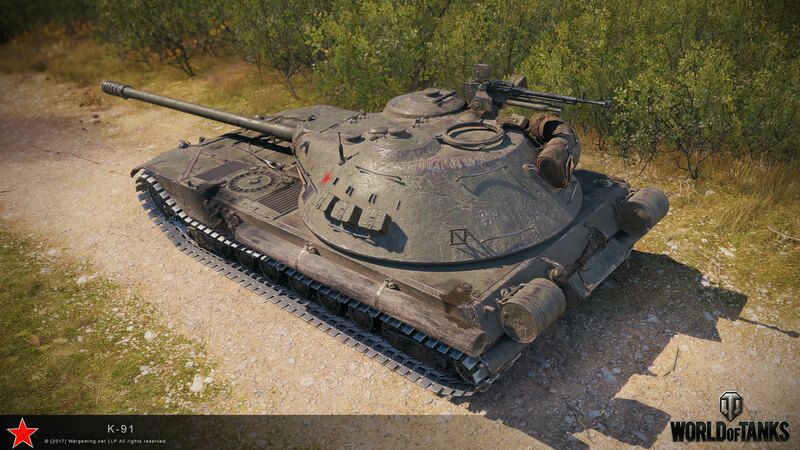 The K-91 will be introduced as Tier X medium tank, after Object 430 II. The tank started to be developed between March-August 1949, it was planned to have all crew members in the fighting compartment, even the driver, and would have carried a 100mm gun. The project didn’t pass the preliminary design stage and it was cancelled in December 1949. Ehm did everyone alread forget E 50M and Leopard 1? Or pre-nerf Amx 30B? How does a tank with less engine power and being 10T heavier achieve the same speed as the 430 II?Even it’s ground resistance is worse.The cmo rating is totally wrong as well almost double the 430 II.This tanks needs a total rethink. Because top speed isn’t correlated to engine power. Might do 50 km/h, but with that engine ti will take ages to get to that speed. The second problem is: this tank was an heavy! WG decided to classify it as a medium, but the tank project was supposed to be an heavy. Harkonnen won’t admit it but all the camo values on this website have so far been with 100% camo crew. So it is not base camo. Base camo should be more or less similiar to other soviet meds. With camo paint, equipment and food it will be around 26-28%. I’m not sure mate. All I know is what gets shared by the Russians, as I don’t have access to ST. I am. I do pay attention to camo quite a lot and it has been like this every time. However interesting thing to note is that when you first showed 430U it had better camo values then this K-91. So maybe it will have better camo? It would make sense as it looks pretty damm bad so far. Do we know how much exp we need to unlock it or an estimation? Look at the other tier 10 meds, probably not much different. its so ugly, it looks cute !